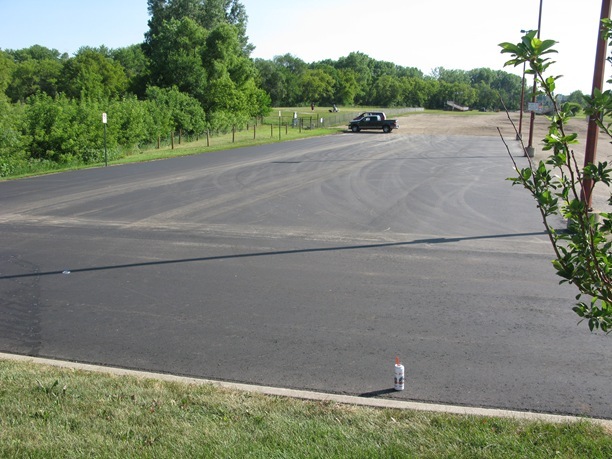 As noted below, approximately 50% of the Babcock Park Rodeo Grounds parking lot was overlayed this week. Local skateboarders were out the following day examining and testing the work completed. Word from the Skate Board Coalition is the group will be working on installing different components over the next several weeks in this area. Nothing about this so far on the Union of Youth’s skatepark page (which is actually the Union of Youth blog with the tag word ‘skatepark’). Looks like they’re going to need a trash container there. With our new schedule (recording and air-time on Mondays) we can’t quite get organized in time to line up guests so once again, it was just us yammering, mainly about the Council’s skatepark decision and subsequent plan to proceed without the PRAB’s input. It was no surprise to me that the Northfield City Council voted 5-1 tonight to reject Ames Park as the location for the skate plaza. Betsey Buckheit was the only one to vote in favor of it. The real surprise was in the post-vote discussion where they opted to take over the criteria setting and planning process for a skate park location from the Park & Rec Advisory Board (PRAB). I briefly chatted with PRAB Richard Vanasek after the meeting who seemed stunned by the latter. Page 29 of the June 1 City Council agenda packet summarizes the history of the skate park location as it relates to Ames Park. On April 29, I emailed each Councilor, asking them if they’d be willing to write up their thoughts about the upcoming vote so that citizens could “know more details about how you’re approaching it, to know more about which of the various pros and cons hold the most validity, to know more about you see the complexities/various shades of gray on the issue.” I’ll attach separate comments for each Councilor who I’ve heard from, and who speaks to the issue during or after the Council meeting. I’ve turned off comments for now until I gather comments from them all. After a send-off to KYMN Radio News Director Dusty Budd (he departs Northfield for fame and fortune in LA next week), we argued vociferously over the community expectations policy, using language that would actually violate the policy had we been recording the show on the sidewalk. We closed with a similarly heated discussion about the skate park. How can Boards & Commissions’ communications be improved? It was just us three citizens yesterday, pretending to be members of the Northfield City Council and discussing how and why we’d vote on the Parks and Rec Advisory Board’s (PRAB) recommendation to locate the skatepark in Ames Park. Straw poll: Locate skate plaza in Ames Park or not? The Northfield City Council has agreed to an up or down vote on the Parks and Rec Advisory Board’s (PRAB) unanimous recommendation to locate the skate plaza in Ames Park. They’ll likely vote next Monday. Feel free to ask questions and comment, even if you don’t take the poll. I’m especially interested in your thinking/explanation of why you voted as you did.